...and to really enjoy your ride. ...you must remain alert and do your best to anticipate potential problems. ...can appear at any time. ...can weaken your ability to concentrate fully on your driving and your surroundings. The best defense against such surprises and distractions when you ride and travel by motorcycle is preparation -- both mental and physical preparation. Through preparation, you can eliminate most potential distractions. 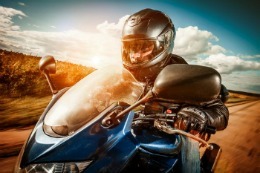 Here are six important motorcycle riding tips you can apply to prepare yourself and your motorcycle before you head down the road. Can you concentrate fully on your riding? Or are your thoughts elsewhere? If my mind is working overtime on a problem or some other distracting thought, I know it will interfere with my concentration when I'm riding. When that happens, I usually postpone my ride for when I'm in better mood or otherwise less distracted. Sure, one of the great attractions of motorcycle riding is the freedom of "going where the road takes you." However, if I'm headed for a specific destination, I try to get my directions sorted out before I'm on the road. I don't want to create a dangerous situation for myself or vehicles near me by driving indecisively or unpredictably while I figure out which way to turn or if I'm headed in the right direction. Getting caught in the rain, riding into unanticipated cold temperatures or facing otherwise undesirable weather when you don't have the proper equipment can sap your strength and make you miserable. Just for peace of mind alone -- even if you avoid riding in certain types of weather -- you're better off by carry a rain suit, warm gloves, a "wind blocking" pullover or other types of protective clothing in case of weather-related emergencies. Some motorcycle riders prepare big time for motorcycle equipment problems by packing enough tools to do a minor engine overhaul. However, others may carry only a cell phone, the AMA (American Motorcycle Association) roadside assistance phone number and a charge card. I think most riders fit somewhere between those two extremes. My motorcycle riding tip, when it comes to handling emergency problems with your motorcycle, I believe it's good for your peace of mind to carry a few well-chosen tools -- especially a tire repair kit -- to handle minor repairs. And it's good to have some sort of emergency assistance available if you're stranded -- such as a brother-in-law with a pickup truck or your AMA card. When I ride, nothing is quite as distracting as the nagging thought that a "small" or occasional annoyance -- such as a cold engine-starting problem -- will get much worse while I'm traveling. I try to avoid such distractions by getting minor problems fixed before they blossom into a trip-stopping breakdown. You can concentrate best on your driving when you have confidence in your ability to operate your motorcycle safely and skillfully-- especially when conditions are challenging. Being a skillful driver and having confidence in your abilities is particularly important when you're driving at night, in the rain or when the road is steep, narrow and twisty. Driving in heavy, unpredictable traffic also requires skill and sharp awareness. You can build such skills and confidence through your own practice and experiences. You can also attend one or more motorcycle driving schools dedicated to teaching various aspects of operating a motorcycle. You can find a motorcycle driving school for virtually every skill level. Taking specific steps to become a better rider, sharpen your motorcycle driving skills and increase your cycle travel know-how is a continuing process. It's also a very enjoyable and rewarding process you can pick up and continue whenever you get a chance.